Are you short, usually sticky, have boundless energy and enjoy making loads of noise? If so then perhaps a Thursday morning at our toddler group might be for you! Let your carer relax and enjoy a cup of tea and a friendly chat while you let your hair down and have loads of fun with other like minded 0-4 year olds. The Toddler group meet, during school term-time. As well as mothers, we welcome dads, grandmas, childminders and any other carer with children. People come from all different faiths and backgrounds and find a warm welcome. The group is run by a team of Christian mothers from the church, who have children and want to share their faith in Christ through this outreach. We aim to be a friendly, caring group where we can relax with a cup of tea or coffee, and we can share our parenting experiences and help each other along a little. 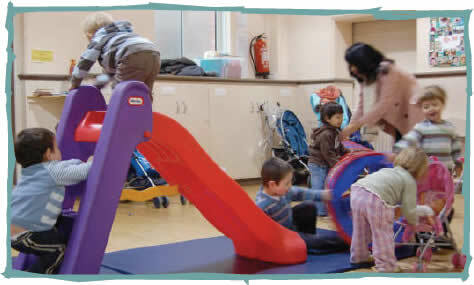 The children have lots of fun playing with the large range of good quality toys. A drink and snack is provided for the children, the older toddlers also have a Bible story, activities and crafts. At the end, we clear the toys away and gather on the mats to sing action songs, and the children love to join in. There is no charge as such for our group, but you can give a voluntary contribution of up to 50p to help towards our running costs, new toys etc. Many parents and children have found our group to be the highlight of their week. We would love to invite you to join us.